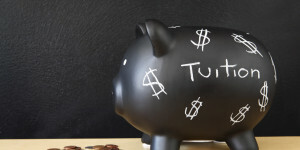 Home › FAQ › What is the Average Price of Tuition at a Public University? What is the Average Price of Tuition at a Public University? The price of college keeps rising every year, which is why many students and their parents want to know the average price of tuition at a public university. A public university is naturally less expensive than a private college. Attending a private college can easily cost $35,000 or more each year, and it’s not surprising for a student to graduate with a total debt in the high six figures. Though public schools do cost less, many might be surprised that it still costs more than they expected. According to a USA Today report, the average price of tuition at a public university hit $18,943 per year in 2014. This figure included the cost of room and board, but did not take into account textbooks and other supplies that students needed. The same report found that community colleges and other schools that offered two year degree programs cost an average of just over $11,000 per year. For profit schools do not traditionally offer housing charged an average rate of more than $15,000 a year. One thing students need to consider is the difference between in state and out of state tuition. Schools charge less for students who live in the same state where they attend college. Before a student receives this rate, he or she needs to prove the student lived there full time or for a majority of the time. This prevents kids from registering under an address belonging to family or a family friend. Students attending a public university in a different state may see their tuition costs rising by more than $10,000 every year. There are a number of factors that can change the price that students pay for college. Though the USA Today report factored in the cost of room and board, the report didn’t indicate the type of room and board it used. Colleges offer a variety of different meal plans, including plans that give students three meals every day or a set number of meals they can use throughout the week. Schools charge various rates for each meal plan. Colleges also charge different rates for a dorm room. It depends on whether a student lives alone, with roommates or in an older or newer dorm. When looking at the average price of tuition at a public university, students must also factor in the cost of the supplies they need. Textbooks can range from just a few dollars for a simple book to more than $200 for a new book with a coupon to access digital information. Students can spend $500 or more on textbooks for their classes each semester. They also need other supplies, including pens, notebooks and highlighters. Some schools may also require that students use a specific type of laptop computer, and some courses require that students use a tablet in the classroom, which can add to the total cost of attending college. Though the price of attending college is around $19,000 a year, this figure does not include the textbooks and other supplies that students need. When examining the average price of tuition at a public university, it’s important that students and their families also think about in state vs. out of state tuition, where they’ll live on campus and everything they need for their classes.